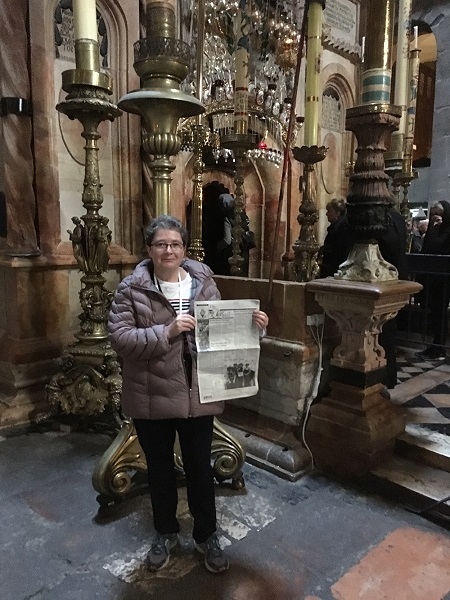 Sharon Hicks of Stronghurst, took "The Quill" along this year, near the end of January, on her travels to Israel to visit the Holy Land. Sharon was traveling with a group from the Canton area United Methodist Church. She is pictured here with "The Quill" at the Church of the Holy Sepulchre in front of the Tomb of Christ. The group was fortunate to see many historical sites and said it was "a trip of a lifetime". Sharon says she definitely would go again! When you go on a trip, take "The Quill" along, and have your picture taken with it, and send it to us. Let's see where all "The Quill" can travel.